While the Canadian death rate has been rising every year since 2008, it was apparently not going up quickly enough for a Toronto-area funeral home. So, recognizing that distracted driving deaths have exceeded drunk-driving deaths in Ontario for several years in a row, Wathan Funeral Home set out to corner a potentially lucrative market. 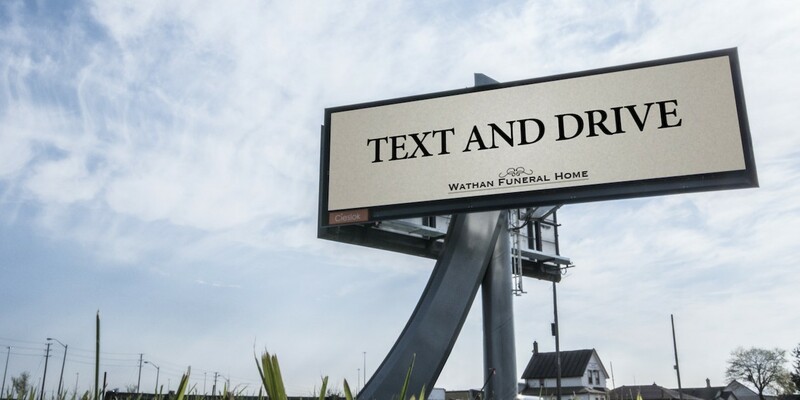 Those motorists sufficiently outraged by the billboard’s callous nature to conduct a Google search for the Wathan Funeral Home are directed to a website that reveals the OOH ad is actually part of a campaign to help stop Canadians from texting and driving. “If you’re here, you’ve probably seen our “Text and Drive” billboard. And if you have, you probably came to this website to tell us what horrible people we are for running an ad like that. And you’d be right. It is a horrible thing for a funeral home to do. But we’re not a funeral home. The site also lists some of the dire statistics about texting and driving (“Last year distracted driving contributed to the deaths of 78 people in Ontario;” “Drivers engaged in text messaging are 23 times more likely to be involved in a crash”) in sections linking to flowers, caskets and monuments. Cedric Audet and Sebastien Lafaye, a creative team at John St.’s Montreal office, conceived the public service announcement, which went from conception to execution in a mere two-and-half weeks. Toronto’s Cieslok Media donated space on the digital billboard, which will run through the next week. Anti-texting and driving ads have become commonplace in recent years, taking a variety of forms: Some focus on the terror of a high-speed car crash, others on the effect it has on other drivers or the impact losing a loved one can have on their family. The one thing that binds them all together, however, is a simple message: Don’t text and drive. While the obvious inference of the funeral home ad is that texting and driving kills, Angus Tucker, partner and executive creative director with John St., said it was designed to stand out from its counterparts. Hopefully the answer in this case is no longer than a split-second.